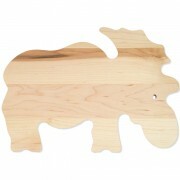 These moose cutting boards are available in Maple or Cherry. It measures 14 x 10 1/4 x ¾” inches (35.56cm x 26.1cm x 1.9cm). Wholesale pricing is available on these cutting boards. They are made from high quality hardwood, available in Maple or Cherry. They come with a smooth finish and soft edges and ready to be treated (optional). Bring a touch of the wild into your kitchen. Armed with your trusty paring knife, attack the atavistic apple, the barbarian Brussels sprout, the dangerous daikon, the feral fennel, the fierce fig, the savage sweet potato and the wild watercress. To do it right, you need an official moose cutting board made of maple or cherry. Measuring 14” x 10.25” x .75” (35.56 x 26.1 x 1.905cm), it is the perfect size to tackle a mound of rowdy fruits and vegetables. Need to carve a chicken or other fowl? This cutting board can handle it with ease, giving you’re a firm cutting surface that won’t slip and slide. Serving cheese to a group? These moose cutting boards gives you ample space for arranging and slicing, providing a conversation starter at the same time. Wood is the perfect cutting surface, more sanitary than either plastic or glass. It kills bacteria and other kitchen hazards, outperforming other materials in test after test. Wood has intrinsic properties that kill bacteria and prevent its growth. Plastic scratches easily, which makes it hard to keep clean, even if you run it through the dishwasher. Wood is kind to your knives. It doesn’t dull the cutting edge, a real problem when you use glass or ceramic surfaces. Wood is durable. With minimal care, it will last a lifetime. Just clean it by hand using warm water, rinse and dry. And you can use both sides. Wood is sustainable. Both maple and cherry are hardwoods with a relatively short growing period. This means it is an environmentally friendly material. These official moose cutting boards are sold in wholesale lots of 25 or more. It is a real crowd pleaser, perfect for corporate events, wedding favors and commemorating a group project. 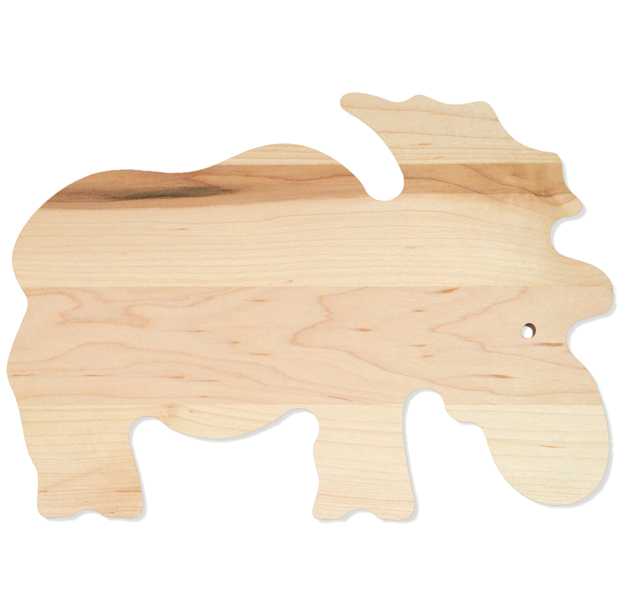 Let everyone at your next gathering bring home one of these moose cutting boards. If you need a custom design or laser engraving, call or email for a free quote for these moose cutting boards.